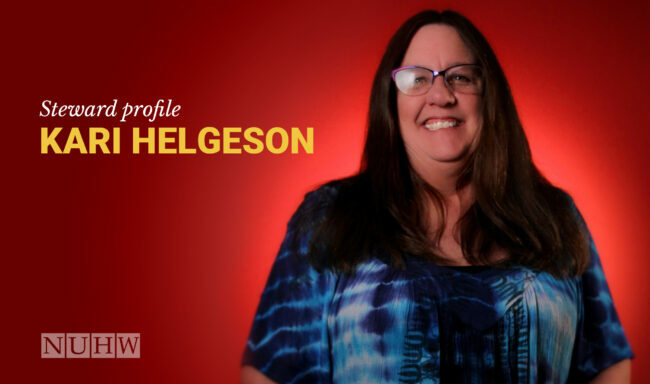 Kari Helgeson can’t remember a time when she didn’t know how to swim. She grew up in Loveland, Colorado, a small town 60 miles north of Denver. The area is dotted with lakes, including the town’s crown jewel, Lake Loveland, a central community gathering spot where families picnic on the shore, children graduate from floaties to freestyle, and elders go for their daily exercise. When Kari was growing up in Loveland, students had to pass a basic swimming course in order to receive their high school diploma. Kari could have passed that course in elementary school. But it was at Loveland High, situated on the lake’s northern shore, where Kari learned to see swimming as a team sport. She and her teammates competed not just to win their individual races, but to achieve a common goal, a team victory. It was her high school coach, Kevin Polansky, who instilled in her the importance of looking out for her teammates, standing up for them, encouraging them. “My swim coach really instilled in me the importance of lifting each other up,” Kari said. And those values have informed her life. After graduating from Aims Community College in Greeley, Colorado, Kari became a radiology technologist in Phoenix. Kari later moved to Humboldt and had been serving the community at St. Joseph for nearly 15 years by the time her co-workers started talking about organizing with NUHW. She was initially skeptical about forming a union. But it wasn’t until she took part in the bargaining process that Kari fully understood the importance of her union work. “Management showed their true colors,” she said. They demanded takeaways without fully grasping the impact on caregivers of patients. Kari and her fellow caregivers each did their part to confront management and win a good contract. Kari’s community spirit is in evidence outside the hospital walls, too. For more than a decade, Kari has volunteered at various music festivals, including the Kate Wolf Music Festival at Black Oak Ranch in Mendocino County. It’s not so much the music that keeps her coming back year after year, it’s working with the Armadillo Crew, a band of volunteers who work to keep lost or abandoned animals safe throughout the event. For the past six years, Kari has been taking part in another annual event, the Humboldt County Kinetic Grand Championship, the “triathalon of the art world,” which will celebrate its 50th anniversary when it takes over Humboldt Bay on Memorial Day weekend. The frenetic three-day, 42-mile race combines art, engineering, and cycling in a high-spirited event that sees large, human-powered art vehicles traversing land and water to reach the finish line. Kari is a proud member of Team FunGuy, which earned an “ace” in both 2016 and 2017, a coveted designation conferred only on teams that have completely followed the race’s rules. Each team consists of one or more pilots who operate the vehicle and a corresponding number of pit crew members to keep it running. Kari is a proud “peon” — one of fifty team members who support the effort from the sidelines by doing whatever is needed, from cheering to using homemade trinkets to good-naturedly bribe judges, spectators, and rival teams.